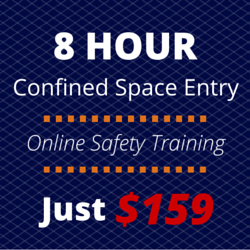 Confined Space Entry training is an essential part to many job roles, and OSHA Pros offers an exemplary 8 hour online OSHA certification to fulfill just such a requirement. With the ease of a computer-guided lesson plan, your employees will be aptly prepared for confined space entry duties as entrant or attendant. Looking for the new OSHA Confined Space Training for Construction? OSHA Pros is the country’s leading training and compliance expert, offering programs in a wide variety of OSHA standards for construction, general industry, confined space entry, and more. With the Online OSHA 8 Hour Confined Space Entry Training Course, employees can be prepared for the rigors of their job environment as an entrant or attendant. Each section covered will also involve a quiz to check their knowledge, and the 8 hour course ends with a final exam requiring a score of 70% or better to pass. Once this course is completed, trainees may print out a certificate of completion immediately. Choose OSHA Pros for your confined space entry training needs – much like the confined spaces themselves, you don’t want to go in blind!